Inspired by his upbringing in 1970s Mexico City, Academy Award-winning director Alfonso Cuarón (Gravity, Children of Men) created a cinematic masterpiece that is sure to receive Oscar attention. 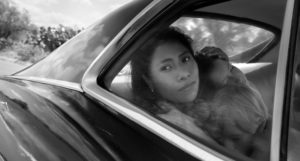 Roma is a semi-autobiographical, Spanish, black-and-white film that explores the depths of Cuarón’s ordinary family life through the eyes of his housekeeper, Cleo (Yalitza Aparicio). Cleo works for a middle-class white family who lives in a spacious townhome in the Colonia Roma neighborhood. At the introduction of the film, the family of six seems to live a good life. The patriarch, Antonio (Fernando Grediaga), is a successful doctor, although regularly on business trips and rarely present. His wife, Sofia (Marina de Tavira) is a biochemist by trade, but she’s constantly preoccupied with her four energetic children Toño (Diego Cortina Autrey), Paco (Carlos Peralta), Pepe (Marco Graf) and Sofi (Daniela Demesa) along with the whereabouts of her husband. The mostly silent protagonist, Cleo, spends her days tending to the family doing typical housekeeper duties, but she is also very much a part of the family and acts as another parent to the children who look up to her. Cleo works alongside her best friend, the family cook, Adela (Nancy García), who is from the same village. During their rare time off, Adela introduces Cleo to her cousin, Fermín (Jorge Antonio Guerrero), who she coyly takes a liking to and they spend time going to the movies and the park, among other things. Like Antonio, however, Fermín soon proves a point that Sofia once made to Cleo in passing, “No matter what they tell you – women, we are always alone.” Cleo ends up discovering Fermín’s cowardly ways and his inability to take responsibility for his own actions. After telling him she thinks she’s pregnant, he pretends to go get more candy at the movie theater and makes a hasty exit, leaving Cleo and his baby…forever. Cuarón takes audiences on an emotional ride with several gut-wrenching moments that are sure to leave a lasting impression. With an underlying theme of shared loneliness, no matter the social class or money in the bank, audiences will empathize with these characters. The score-less film can be slow-paced at times, but the film is more than salvaged by Cuarón’s detailed precision – altering use of long takes, strategic close-ups, and wide-shots that allow the even the most simplistic scenes to brim with life. It’s clear that Cuarón fully invests himself in his work, but Roma is an exception. Cuarón explained that while he enjoys collaborating with other writers and filmmakers, fully welcoming their criticism, he didn’t want outside influence to cloud the authenticity of his story. In fact, he didn’t even share the script with the cast. Instead, he provided daily scenarios and let the dialogue play out naturally. Interestingly, he shot the neo-realist film chronologically in order to help the actors truly feel the emotions and react to their characters. 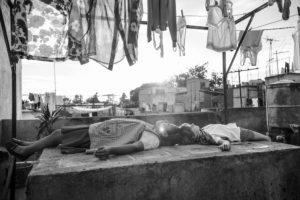 Bottom Line: Renowned director and writer Alfonso Cuarón mesmerizes audiences in the black-and-white drama, Roma, a remarkable tale about his own childhood in 1970s Mexico City through his housekeeper’s eyes. This masterpiece sparks compassion for each character – through few words, a raw narrative and stunning cinematography. Roma will undoubtedly be an Academy Award Foreign Language Film (and maybe even Best Picture) contender for 2018. Although it will be released on Netflix on December 14, it is highly encouraged to see it in theaters.